WARBIRDS STORIES - Everything for the WW2 aviation enthusiast! B-17G No. 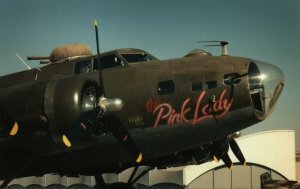 44-8846, "Pink Lady / Mother and Country"
flew six operational missions, over Germany, until April 20, 1945, when the 351st BG flew its last combat one. On most of these combat missions, she led the squadron or the group, in her pathfinder role. Shortly afterwards, the 351st BG flew back across the Atlantic Ocean, but '846 did not join them and was transferred to the 365BS, 305st BG, at Chelveston, Northamptonshire. This Bomber Group was meant to stay in Europe after the war's end. From july 1945, the group moved to Belgium, then to Germany, performing photographic duties. It was then disbanded on Christmas Day 1946. '846 still stayed in Europe, joining a number of different units, until February 1953, when she was crossing the ocean to be assigned to the Ogden Air Material Command Centre, Hill AFB, Utah. This was to be the end of her Air Force career. On december 5, 1954, she flew once again to Europe, having been sold to the French Institut Geographique National (IGN), which had been operating B-17s since 1947 on aerial survey work. She was then registrated F-BGSP, and based at Creil, in the north of Paris. She was modified with special survey equipment, and made several successful missions across the world. At the end of 1979, she was withdrawn from use and stored. Most of her 13 IGN counterparts had already been donated to Museums or sold. The Forteresse Toujours Volante (Still Flying Fortress) association was then created by the IGN, the Amicale Jean Salis, famous warbirds operators from La Ferté-Alais, and several other people, to fly and display this historic aircraft. In may 1985 she changed her registration to F-AZDX, as a collection aircraft, and was painted with fake 8th Air Force markings. She took the Lucky Lady surname, and was then flying without turrets. 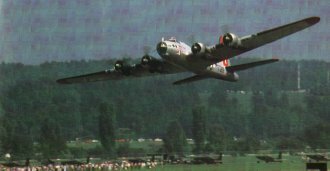 In june 1989, David Putnam was to shoot his Memphis Belle movie, so '846 flew to England along with the last IGN Fortress, F-BEEA, which was sadly lost during the shooting. F-AZDX was then painted in olive drab, and adopted the serial number 25703, along with DF-S fuselage codes, as "Mother and Country". Fake turrets were fit on the aircraft. In august 1989, the filming was complete, and F-AZDX flew back to France. Now '846 sports to different identities on each side of her fuselage. 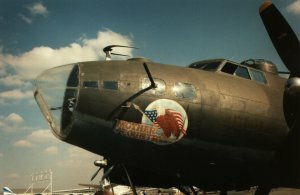 On port side, she's "Mother and Country", as pictured in Memphis Belle. On her starboard flank she's Pink Lady, s/n 22-960. She is now based at Paris-Orly Airport, and still flies thanks to generous contributions. Thanx to Laurent Boulestin for his help.